I'm excited to have another guest host here on Come Together Kids. After you read about this cute pumpkin craft she's sharing here today, you have to check out Lorie's blog. She's only been blogging since August, but she has already shared tons of great ideas. I love how she uses her love of books and her knowledge as a reading specialist to tie together great books with fun activities. Plus, her blog has several tabs with great tips for parents to use when reading with their children ~ so handy! Hello! I am so excited to be here! A great big thank you to Laura for allowing me to do a guest post! I'm Lorie from Reading Confetti and just recently started blogging. I'm taking some time off from being a reading specialist and teacher to stay home with my 3 year old son and not-quite-2 year old daughter. I've taught third through eighth grades and am now focusing my efforts on my preschoolers, so my blog is about making reading fun for kids of ALL ages. 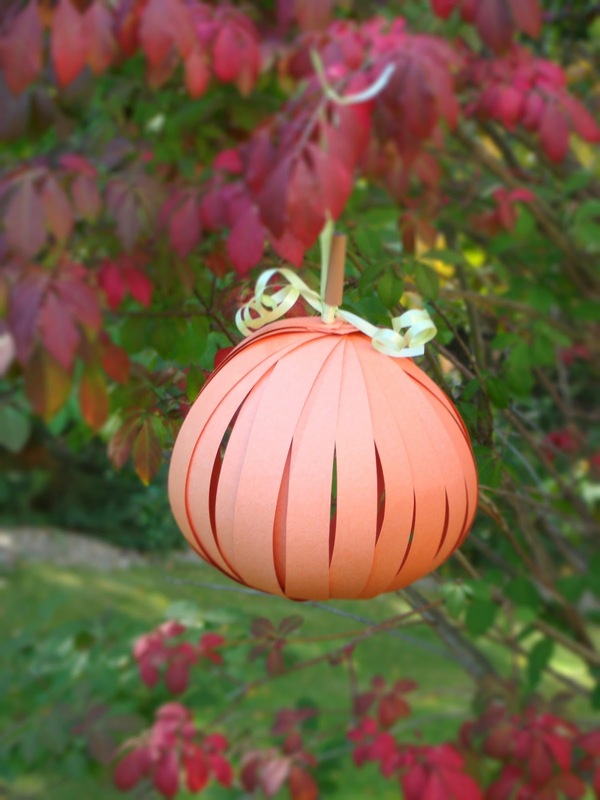 The project I'd like to share with you today is a paper pumpkin decoration. 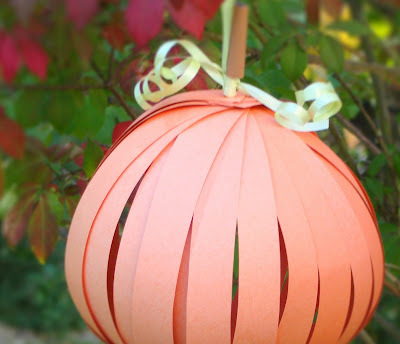 Cut strips from the orange paper and punch a hole in each end. I didn't even measure the width - just tried to make them roughly the same size. The important thing is to make sure they are the same length and the hole is approximately in the same spot on each. This will keep your pumpkin from bulging in some spots. I had to overlap two holes a little because my punch was slightly smaller than my straw. Thread one end of each paper strip onto the straw. Thread the other end onto the other end of the straw. Add as many strips as you need to make your desired fullness. Fold the bottom of your straw and secure it with some tape. Tie a few lengths of green curling ribbon around the top and curl. Leave two tails uncurled so you can tie them together and use them to hang your decoration. Put a roll of brown paper around the top of the straw to make your stem. That's it! Cute and easy! To go with our craft, we read The Runaway Pumpkin , an adorable story about a pumpkin that goes rolling down a hill, scattering farm animals along the way. I hope you and your little (or big) readers have fun with this and I'd love for you to stop by Reading Confetti! Thanks so much for sharing your cute paper pumpkins, Lorie! I definitely plan on letting my kids make their own pumpkins with some of the tons of scrapbook paper that I have here at home. I also love how you used the straw as the base. I've seen it done with a brad before, but the straw makes it easy for even little ones to do this activity and it gives you the base for your stem ~ so smart! And readers, make sure you stop by Reading Confetti to check out all the other great ideas. Lorie recently shared a fun post with all sorts of Book Inspired Halloween Costumes.that would be so cute for your little readers! Cute! I love it when I already have everything that I need to do a project at home already! Awesome work of an art. Teaching kids how to make one on their own would help them enhance their own creativity. This could give them more ideas by making use of other available resources that they have for them to invent unique craft. Assignment Help by Professional at a very low price. Looking for Assignment Help? Contact our expert writer for plagiarism free content & on-time delivery with affordable prices. I just loved reading it. Really appreciate your efforts. It was also very nice getting knowledge from Findchainsaw website. I would recommend everyone to read it for more details! I checked out people are proving links of different writing firms, but i prefer to first read expert reviews then select a writing service. ooceanofgame.com The one and only source which provides games for kids without any money or survey. its totally free and enjoyable. I enjoy this this article very much. I love this post thanks for this amazing information. allassignmenthelp.com Reviews has helped many students to choose the right website. It has also helped the students to score good grades in their academics. Our writing services review will help you to find the best writing websites for your success. AllAssignmentHelp Provider is helping students especially in usa in getting brilliant quality reviews writing USA, essays and dissertations.We at Top Quality Assignment believe that there is no shortcut to success and to attain success, hard work, dedication, and commitment must be present.AllAssignmentHelp reviews best in writing unique Assignment. We are an amazing assignment writing company of professionals who would surely assist you in your home tasks at affordable prices. I always love creativity, and this post really encourages me to write here. For kids all type of activities are important. More and more younger kids are engaging with video games then ever before. My own brother plays Modern Combat 5 Apk offline all day. Your blog really helps visitor all the time. Thanks for Always bringing Value into your blog . What a great piece of content. Exactly to the point and concise with all the information. Thanks alot for this beautiful information! Thanks for sharing this amazing information. Nice Informative Post. Great work Really Appreciated. The place else may just I am getting that kind of information written in such a perfect way. Students Assignment Help serves the qualified assignment writers from top universities in the world who offers its best make my assignment. We deliver the assignments before the deadline. Hey, great article you have there. I am sure that the students looking for assignment helpand ways to write their assignment got to learn a lot of things that were not clear before. The students who need guidance on how to write an assignment, I am also an academic expert who provide online assignment help to the university going students in their academic tasks at My Assignment Services. We are a team of professional experts who are all either a Master’s degree holder or a PhD scholar. For years, we have aided students who are busy in their part time jobs or cannot take out sufficient time for assignment writing. Their can you do my assignment questions are successfully addressed at My Assignment Services. Students Assignment Help is the moral spot where understudies can get essay help benefits at the best cost. Our expert scholarly essayists dependably help understudies recorded as a hard copy task which is free of copyright infringement. Get Online Assignment Help with USA assignment helper from studentsassignmenthelp.com. Get high quality work from our experts and our experts check our completed assignment three times before giving to the students. Get the essay writing services outstandingly by the high qualified experts at UAE Assignment Help. Our faculty is proficient in writing any assignment. If students are not satisfied with our assignment work, then we also provide free revision services and well reserached content to them. Hurry up! SingaporeAssignmentHelp.com is offering 10% discount on Essay writing help. Save your money with our experts writers and get discounted assignment help at anytime with higher grades.